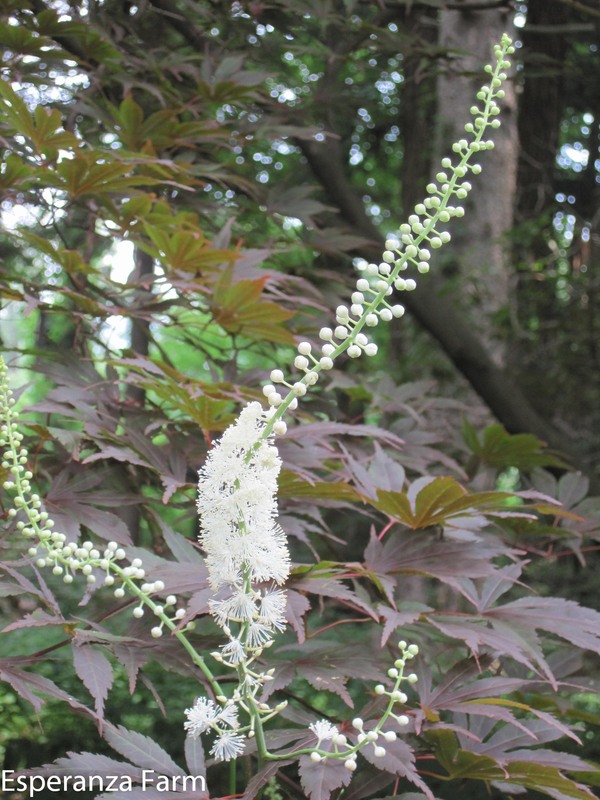 Also known as bugbane and black cohosh, with the latin name of actaea racemosa (formerly cimicifuga racemosa); snakeroot is a eastern N.A. native growing from Ontario to Georgia. It is increasingly rare in some areas, actually considered to be threatened if not locally endangered in Ct. This is probably because it is a slow growing plant, taking several years to flower, and prefering shaded, damp woods. The closely related a. simplex is the species from which the cultivated types have been bred, including the purple varieties. Esperanza has a lot of snakeroot, to the point where it is almost a nuisance in some spots. A fully mature plant really should be considered as an herbaceous shrub. It is the backbane of the late July garden, the flower spikes (which can reach 8 feet) twist and turn in a wonderfully dynamic fashion. Despite the name bugbane, the pollinators love it. The one in the picture is growing up through the low branches of a Japanese maple.